No, this isn’t a factory accident: it’s a painstakingly crafted handmade shoe. I know: it’s been a weird week. Bootcut jeans are back, and now you’re staring at a pair of sneakers that look more like a science experiment than designer fashion. 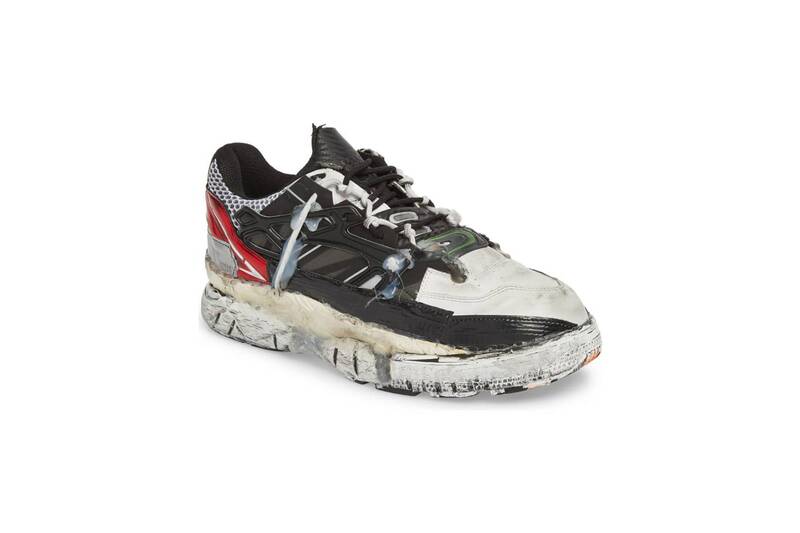 But you’re just going to have to trust me when I tell you that these—the Maison Margiela Fusion sneakers—are worth your time, and quite possibly the one thousand six hundred and forty-five hardest-earned dollars it’ll take to get them. Margiela has made sneakers before—but, naturally, with a serious postmodern twist. In the early 2000s, the brand stamped standard-issue German army sneakers with its signature numbering and sold them at designer prices, and then moved on to producing its own, luxed-up versions. This was the sneaker as Duchamp readymade: simply by calling the army trainer a designer good, Margiela made it so. On its surface, the Fusion sneaker seems like a different beast: less a reworked, reappropriated history lesson than a mutant assemblage. But a closer look reveals that the shoe—while playing with many of the sneaker world’s favorite 2018 tropes—is a Margiela product at its core. Start with the silhouette: a running shoe, but blown up to exaggerated proportions. This isn’t quite a Balenciaga Triple S, but in a fashion universe full of oversized kicks, it fits somewhere between Versace’s marshmallow-soled Chain Reaction and A$AP Rocky’s supersized Under Armour skate sneaker. But the Fusion is a real mishmash—as a Margiela rep says, “conceived from the idea of mixing different parts of iconic sneakers, a condensed index of the training shoes that are part of the collective today.” So you get a bit of red plastic caging on the side, what looks like a carbon-fiber weave on the tongue, and faint strips of something that is either reflective paneling…or duct tape. 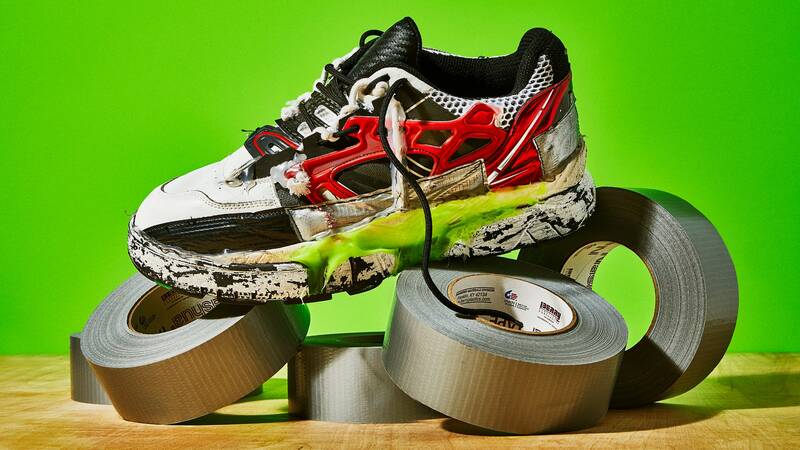 And while the Fusion looks like it emerged from a chemical spill at the sneaker factory, it’s delicately assembled. Each pair is made completely by hand, the visible hot glue left as a symbol of the work that went into each pair. Margiela’s famous numbered tag is applied to the sole, fixed in place with that neon-great silicone, and the whole thing gets roughed up and distressed. The final product is a strange beast. When we think of custom, handmade goods, we think of bespoke suits, or made-to-measure pants with customized pleats, or crocodile shoes. Mostly, we think new. The Fusion…isn’t that. Instead, it shows its guts, displaying all the weird, gross refuse that goes into making clothes—test materials, detritus, adhesive—on its face. None of which changes the fact that these are difficult shoes, designed to challenge the way we talk about and value sneakers. They might not be for you. But when 2020 rolls around and we’re all wearing bootcut jeans and $1600 Frankenstein sneakers, we’ll have a good laugh together.